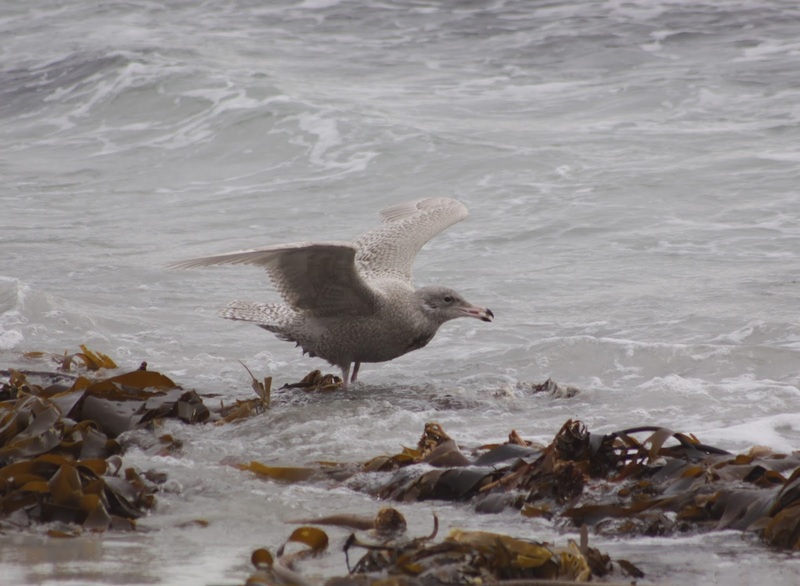 A 'stank' around the south and eastern parts of the island on 26th was largely unproductive with hoped for increases in wildfowl and gulls feeding in the swell failing to materialise. That date did however produce the best counts of passerines with 44 Redwings (including likely 20 new arrivals at Holland gardens), 20 Fieldfares, 29 Blackbirds, a Chiffchaff at the observatory, 45 Twite and 2 Linnets logged. The Green-winged Teal was seen at Gretchen on all three dates while a look at the northern end of the isle on 28th yielded better results. The male Northern Harrier was seen in the Garso and Ancum areas and bar the occasional (thus far undetected) wandering elsewhere he has now clocked up an impressive two months on the isle. A juvenile Dark-bellied Brent Goose at Lenswick (and later past the Obs) was a decent newcomer, an additional adult Whooper Swan had joined the 3 lingering birds, the hybrid American x Eurasian Wigeon was at Bridesness and 31 Snow Buntings near Bewan. Northern Harrier - still here! Well its definitely winter!! Frequent spells of cool northerly or north-westerly wind accompanied by either rain, sleet or even snow showers have resulted in relatively little change during the period. With the volunteers all having heading south, coverage is much more limited these days but highlights included the male Northern Harrier again (22nd) and the drake Green-winged Teal (22nd-24th). New parties of Whooper Swans have been a pair of adults (22nd), and a family of 5 (25th) while the redhead Smew was still on Bewan Loch (21st-22nd). 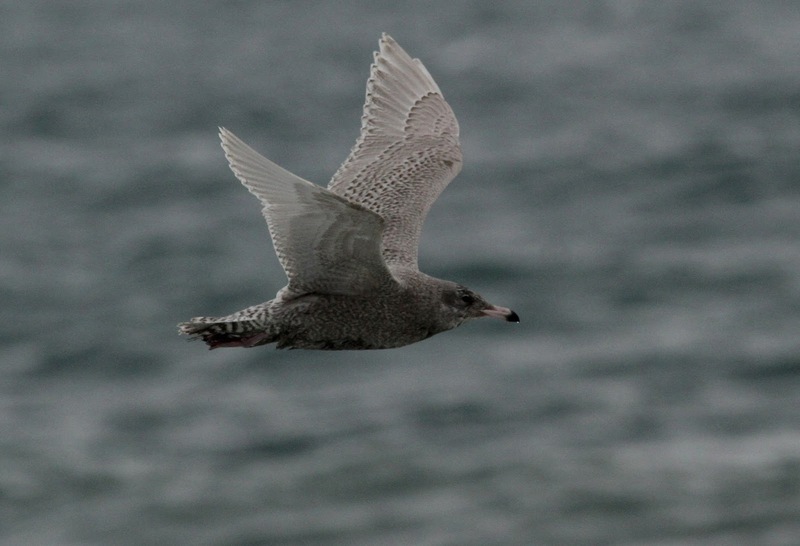 An hour long sea-watch (21st) saw 5 Sooty Shearwaters, a Little Auk and a juvenile Glaucous Gull pass the hide but the same duration the next day was much poorer with just a Black-headed Gull and 626 Auk sp. of note. A Long-eared Owl was at Holland gardens (21st-22nd), a male Brambling also there (22nd and 25th), at least 4 lingering Chiffchaffs were spread about, Twite peaked at 36 (on 21st and included a dozen trapped and ringed to seed at the Obs) and finally there were 19 Snow Buntings at Bridesness (22nd). Cold!! The best way to sum up the day with sleet showers and a brisk north east wind. There had been a calm spell overnight after the most recent storm, and this prompted some seabird passage with 2.5 hours sea-watching from the hide returning totals of 19 Sooty Shearwaters, a Manx Shearwater, 1263 Fulmars - including 22 'blue phase' individuals, 375 Gannets, 54 Kittiwakes, a very late Puffin, 11 Little Auks and 1147 Auk sp.. A Long-eared Owl, roosting behind a wall near the sea-watching hide had presumably recently crossed the sea and was freshly arrived and the Smew and 5 Goldeneyes were among the wildfowl on Bewan Loch. With winds originating from either the north or west and the last of the volunteers having moving on, there's definitely a winter feel about the place. After the late fall summarised in our last entry, fewer birds were seen on the 17th with 14 Woodcocks, 5 Robins, 184 Blackbirds, 155 Fieldfares, 11 Song Thrushes and 86 Redwings recorded. By the 18th there was an even greater reduction with no more than 40 of any thrush species but there was a Chiffchaff on that date with 2 further individuals at the Observatory on the 19th. The male Northern Harrier was back on the island and seen daily from 17th to 19th with the drake Green-winged Teal (17th and 18th), Common Scoter (17th-19th) and Smew (17th) all lingering too. An adult Glaucous Gull was at Bewan on 17th with a mobile juvenile around the south end the next day and at least 2 Hen Harriers have been present throughout. Heavy rain and a strong south-east wind overnight delivered perhaps the final fall of the year making for a surprisingly busy day in the field. There wasn't a huge amount of variety, but a dawn to dusk 'thrash' around roughly 50% of the island revealed some decent totals of late migrants. As expected, thrushes dominated with 311 Blackbirds, 750 Fieldfares, 10 Song Thrushes and 226 Redwings counted while at least 50 Woodcocks were also located. The drake Green-winged Teal had relocated to Gretchen Loch (and hence following the pattern of behaviour of last years wintering bird) and also seen were 6 Grey Herons, 17 Pink-footed Geese, 7 Barnacle Geese, the Common Scoter, 2 Hen Harriers, a Jack Snipe, 9 Robins, 2 Chiffchaffs, a Chaffinch, 7 Linnets, 23 Twite and a Snow Bunting. A sudden drop in the wind to virtually nothing by first light attracted the remaining members of the team up to the hide for a lengthy sea-watch from dawn, while an increasing south-easterly in the afternoon and rain forecast for overnight also offers hope of some late migrants tomorrow. Totals from the busy 4 hour vigil at the north end came to 7 Great Northern Divers, 13 Red-throated Divers at least 1 Black-throated Diver, 12 'blue' Fulmars - with 807 birds counted in an hour sample count, 11 Sooty Shearwaters, a Manx Shearwater, 622 Kittiwakes, 20 Little Auks and 1062 Auk sp. with an additional 211 Guillemots and 11 Razorbills specifically recorded. A required Goose count used up remaining daylight in the afternoon but a drake Green-winged Teal at Bridesness Loch was a nice surprise during the 'drive-about'. The American x Eurasian Wigeon hybrid was also there, the redhead Smew at Bewan Loch and singles of Hen Harrier, Short-eared Owl and Woodpigeon present on the Isle. 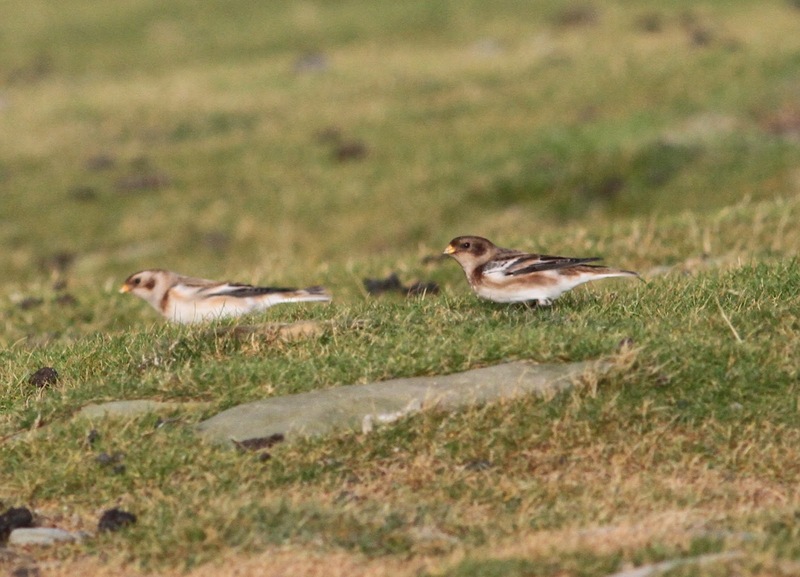 As has been the norm in recent days, few passerines were noted but among those seen coming in off the sea during the sea-watch were a few each of Starling, Twite and Snow Bunting - with 14 of the later recorded in all. 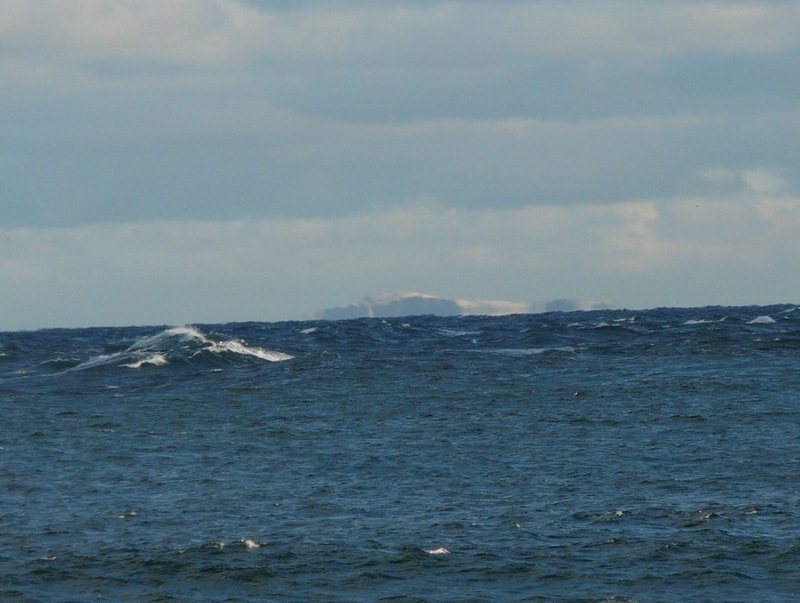 Two days of solid, gale force westerly winds yet still some birds are passing through the island and it remains worthwhile spending time outside avoiding winter paperwork. Highlight on the 13th was an 18 strong flock of (almost certainly Greenland) White-fronted Geese which touched down briefly near Ancum before continuing south. The Pale-bellied Brent Goose, 19 Pink-footed Geese and 8 Barnacle Geese were all seen again as were 35 Long-tailed Ducks and the redhead Smew. The male Northern Harrier was noted at Hooking late in the day with a juvenile Iceland Gull and Great Skua of the Bridesness coast and a Short-eared Owl near Westness. Moving wildfowl were again the feature of the 14th with an even larger, and impressively noisy flock of 52 White-fronted Geese (again not confirmed to race but likely to have been Greenland birds given the winds) coming in off the sea at the Lighthouse before quickly sliding down the east coast to be bound for nearby Sanday. Several groups of Whooper Swans were also logged passing south totalling 29 birds and the Pale-bellied Brent Goose, female Common Scoter and Smew were also recorded. An attempted sea-watch from the Lighthouse yielded 4 Little Auks in an hour and a half with another losing its bearings and heading inland at Hooking while at least 2 ringtail Hen Harriers and 6 Grey Herons were present. The 11th was a mixed bag with sunshine and showers but it was a decent days birding and among a few scarcities, the standout bird was the male Northern Harrier (making a welcoming return since last seen on 2nd). A Pale-bellied Brent Goose seen at a few locations was typical in its timing on the island but nonetheless it was only the second occurrence of the 2015. Meanwhile the Smew and Common Scoter were both seen again, 20 Pink-footed Geese were noted and 13 Whooper Swans included a new group of 9 south. A juvenile Glaucous Gull flew up the Links, 8 Little Auks and 3 Great Skuas were the best from an hours sea-watch and 10 each of Great Northern and Red-throated Divers were logged off sheltered coasts. 6 Grey Herons, a juvenile Hen Harrier, 3 Merlins, a Black Redstart at Westness, similar numbers of thrushes to yesterday, a single Snow Bunting and 32 Twite completed the days totals. By the 12th a storm was brewing but a calm window from midday prompted a 2 hour sea-watch and a female/immature Velvet Scoter was a great reward and nice addition to the 2015 year list. Also seen were 7 Sooty Shearwaters, a 'blue' Fulmar, a Pomarine Skua, a Great Skua, 262 Kittiwakes, 11 Little Auks and 1368 Auk sp. (in a sample 1 hour long count). Otherwise it was just the Smew and yesterdays Pale-bellied Brent Goose seen from a brief 'drive-about' and with gale force westerly winds having whipping up quickly by dusk we'll be hoping for something interesting tomorrow -if we can stand up! 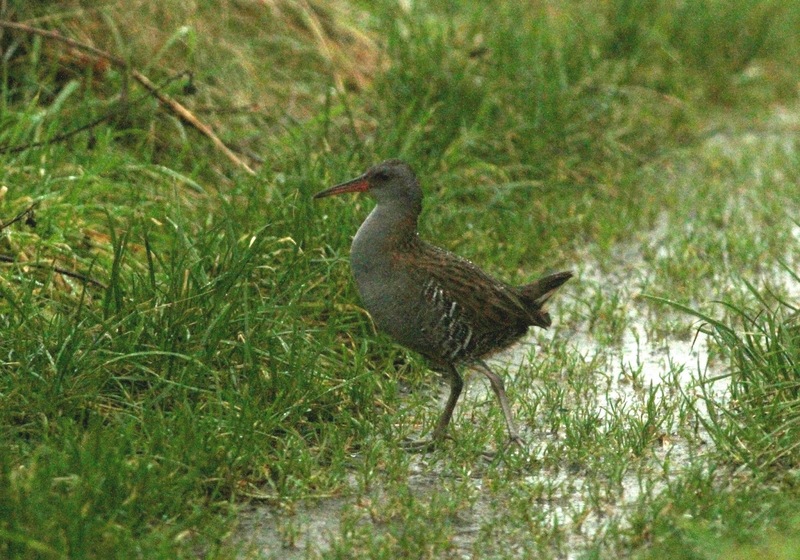 A seriously blustery 9th made for tricky birding conditions and as a result not too much was seen. Of note were a juvenile Glaucous Gull at Westness, the Common Scoter still, a Hen Harrier, Peregrine, 3 Great Skuas and 2 Snow Buntings. Calmer conditions on 10th allowed for more passerines to be tracked down and a good thrash around by the dwindling team discovered a small arrival/increase of winter thrushes. Counted were 124 Blackbirds, 132 Fieldfares, 12 Song Thrushes and 404 Redwings. Other late autumn land-based migrants included 2 Jack Snipe, 2 Woodcocks, 27 Skylarks, 26 Meadow Pipits, 23 Rock Pipits, 6 Robins, a Chiffchaff, Siberian Chiffchaff, 2 Goldcrests, 8 Bramblings and 10 Snow Buntings. The Smew was still at Bewan Loch while last winters drake American x Eurasian Wigeon hybrid has returned to the Bridesness coast. Seen on an hours sea-watch were 2 Little Auks and a Sooty Shearwater, there were 3 Little Grebes at Bridesness Loch, 10 Red-throated Divers offshore, 16 Pink-footed and 8 Barnacle Geese among the Greylags and 2 juvenile Hen Harriers toured the island. 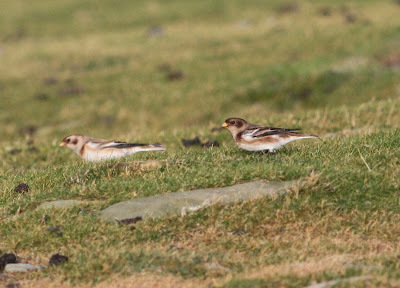 Snow Buntings (photos George Gay). 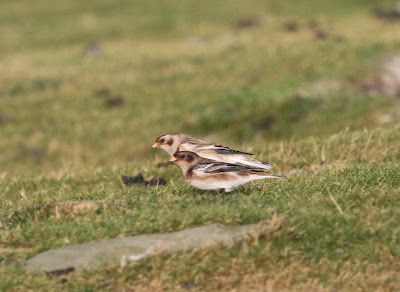 Until now, most if not all of our Snow Buntings have appeared to be of the Scandinavian/Greenland race nivalis. The darker bird photographed here on 9th along with a whiter nivalis type, is a clear example of insulae, or Icelandic Snow Bunting. Further south-easterly winds which increased to near gale force by the afternoon offered up renewed enthusiasm for the team resulting in slightly better migrant figures being posted. A Ring Ouzel near the mast was new and the days totals of 110 Blackbirds, 116 Fieldfares, 5 Song Thrushes and 149 Redwings were all marginally higher than the last couple of days and there was also a Blackcap, 4 Chiffchaffs, 7 Goldcrests and 5 Snow Buntings. An hours sea-watch was typical of the last few attempts with 2 Sooty Shearwaters, 248 Fulmars, a Great Skua, 3 Little Auks, and 843 Auk sp. logged. The Smew remains on Bewan Loch, 27 Shovelers and 16 Long-tailed Ducks were decent counts while a Water Rail in the road at Nether Linnay looked somewhat out of place. Its taken 311 days, but at last the first Greenfinch of 2015 was seen today!! The species isn't exactly common here but the year's bogey bird finally fell with a single south over the airfield (and presumably the same later near the school). 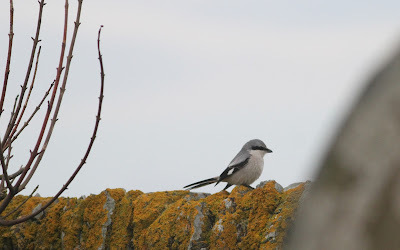 Other passerines were recorded in similar numbers to yesterday with a ringed Great Grey Shrike in the Kirkyard the most notable. In an hour and half of sea-watching passed 5 Sooty Shearwaters, a late Manx Shearwater, 5 Great Northern Divers, a Pomarine Skua, 2 Great Skuas, a Little Auk - with another in Nouster Bay and 1026 Auk sp. The Smew was seen again on Bewan Loch, another pulse of Whooper Swans saw 17 recorded (14 new birds plus the 3 long stayers) while 10 Pink-footed Geese and 8 Barnacle Geese have been around a while now and look set to winter among the Greylags. With better weather and being quite late in the autumn, it was to be expected that most of yesterdays birds would move quickly on. There were far fewer Thrushes in particular, but 100 Blackbirds, 439 Fieldfares, 7 Song Thrushes and 65 Redwings were still counted. A Great Grey Shrike at Scotsha was likely a new bird and also seen worth mentioning were 4 Grey Herons, the Common Scoter, 2 Great Skuas, a Short-eared Owl, a Black Redstart and a Lesser Redpoll. With an increasing south-easterly wind and a few more birds today its beginning to feel like there could be another arrival on the cards in stronger winds due tomorrow. 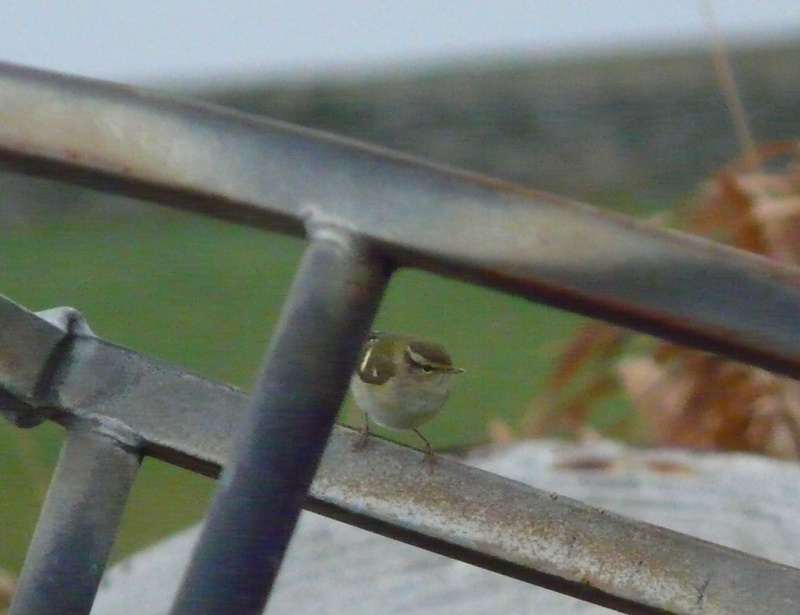 Among the newcomers today were the first Yellow-browed Warbler for over two weeks at Vincoin and a Long-eared Owl trapped and ringed at Holland gardens, where the ringed Great Grey Shrike last seen on the 1st reappeared. After lower counts recently it seems likely that at least some of the 9 Short-eared Owls flushed from a small area between Senness and the Lighthouse were new as particularly large numbers recently. There was also a small arrival of Fieldfares with 409 counted, plus 85 Blackbirds, 191 Redwings, a Black Redstart, 11 Robins, 5 Blackcaps, a Goldcrest, 5 Bramblings and 14 Snow Buntings. 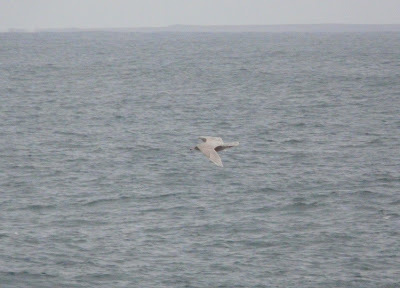 More effort (3.5 hours) of se-watching yielded 8 Great Northern, 20 Red-throated and best of all 2 Black-throated Divers, a 'blue' Fulmar, 11 Sooty Shearwaters, a juvenile Pomarine Skua, 7 Great Skuas, 209 Kittiwakes, 7 Little Auks and 460 Auk sp. Flocks of Whooper Swans passed through again with 29 birds in all, while the red-head Smew, Common Scoter and juvenile Glaucous Gull all remain. 3 each of Jack Snipe and Woodcock were flushed and at least one juvenile Hen Harrier was present, although having tempted fate with two blank days and calm weather it seems our long staying, star attraction - the male Northern Harrier may have relocated to another island. Another overcast but calm day with a small southerly movement of Pipits and Thrushes during the first few hours of the morning when there was also a reasonable passage of birds westwards on the sea. Totals from 3 hours of sea-watching came to 13 Red-throated Divers, 18 Great Northern Divers, 22 Sooty Shearwaters, 2 'blue' Fulmars, 3 Pomarine Skuas (2 adults and a juvenile), 3 Great Skuas, 331 Kittiwakes, 3 Little Auks and 331 Auk sp. On the land were a Short-eared Owl, 2 Black Redstarts, 25 Rock Pipits (including a flock of 10 out south) 70 Blackbirds, 87 Fieldfares, 10 Song Thrushes, 184 Redwings, 3 Blackcaps, 5 Chiffchaffs, 4 Bramblings, 6 Chaffinch, another Lesser Redpoll caught and ringed at Holland gardens, 2 Siskins and 24 Snow Buntings. 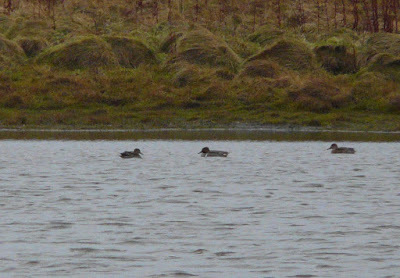 The Smew lingers on at Bewan and the Common Scoter off the links while there was another impressive arrival of some 92 Tufted Ducks - 85 of them on Bridesness Loch! 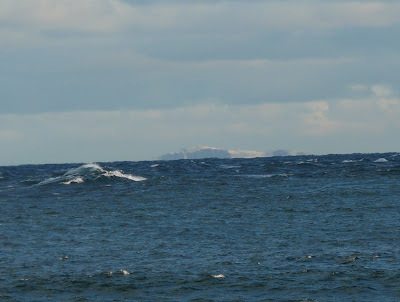 A dry and sunny day with some interest on the sea making up for another relatively static 24 hours on the land. A total of 8 Little Auks passed the island (3 south down the west coast in the morning and 5 west past the north end during an afternoon seawatch) and there were also 7 Sooty Shearwaters, 6 Red-throated and 8 Great Northern Divers, a Great Skua, 159 Kittiwakes and 71 Auk sp. recorded off either the west or north coasts at various times of the day. Both Great Grey Shrikes appear to have moved on but the male Northern Harrier continues to delight the team - it really is a fantastic looking bird in the sunshine! 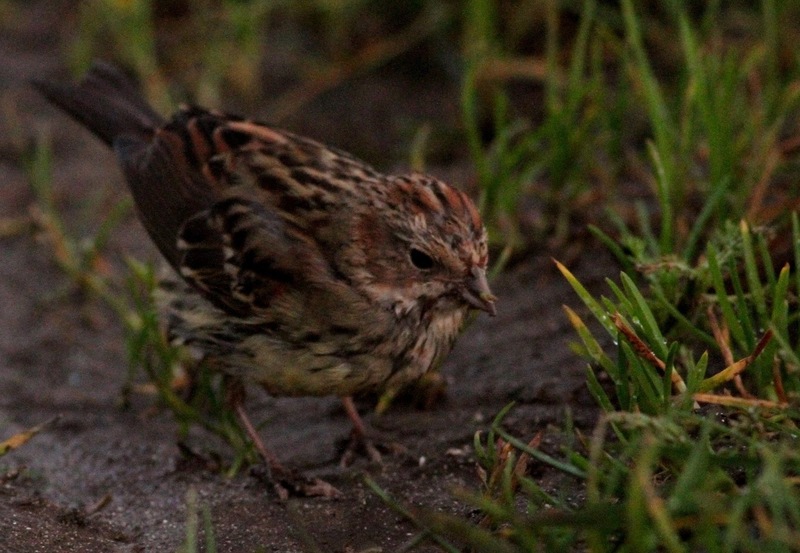 Most passerines were recorded in similar numbers to yesterday but a Lesser Redpoll was new, being trapped and ringed at Holland gardens in the evening where what looks like the Senness Yellowhammer was also processed. 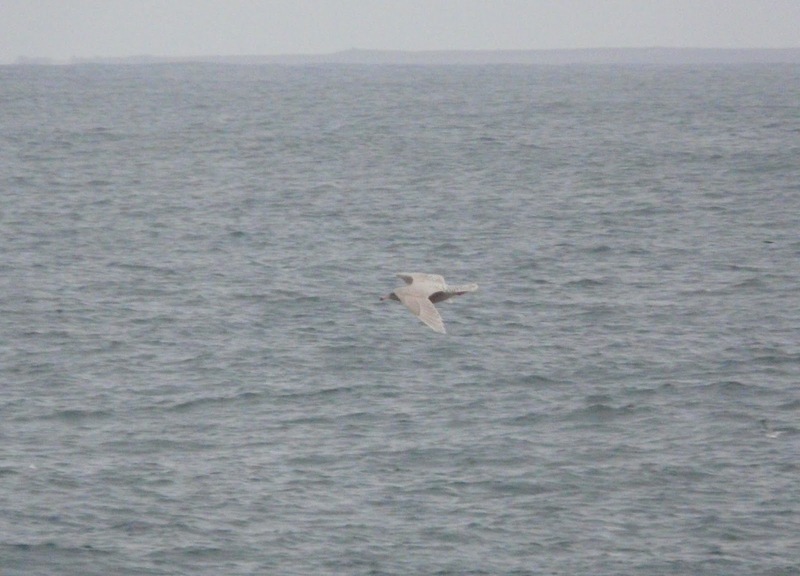 Also seen were 17 Whooper Swans (at least 14 newcommers), the Smew, a Sparrowhawk, a Grey Plover, the juvenile Glaucous Gull around Nouster beach and 2 Short-eared Owls. 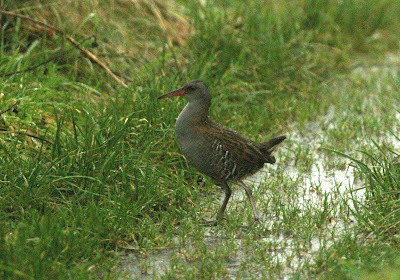 A new month and some typical arrivals for the time of year made for a good tally of species as the autumn begins to draw to a close. 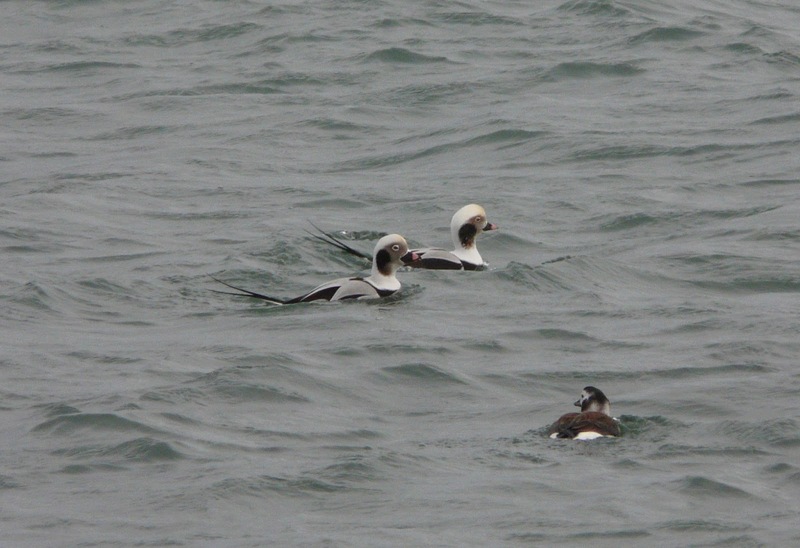 The best bird was a Black-throated Diver during a sea-watch from the north end which also yielded 3 Red-throated and 4 Great Northern Divers and 6 Sooty Shearwaters in an hour. 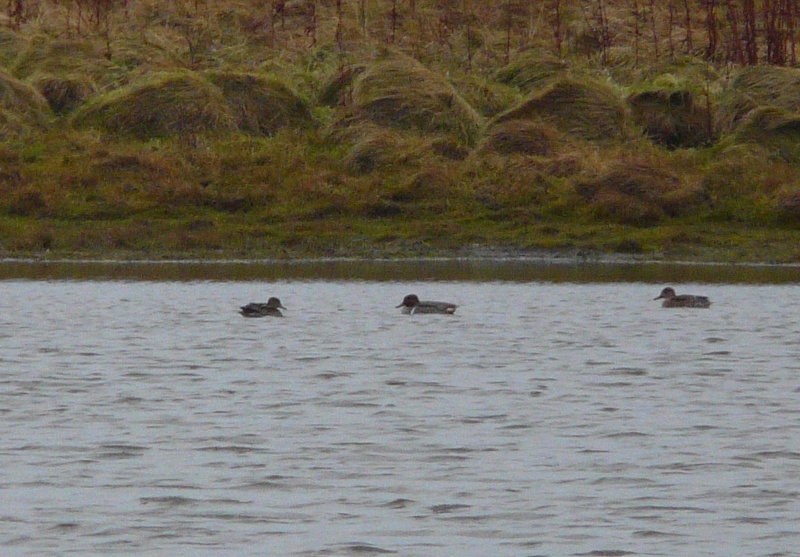 Wildfowl were particularly evident with the redhead Smew seen again on Bewan Loch and a Common Scoter off the links. There were also 324 Wigeon, 215 Teal, 10 Pintail, 21 Shovelers and 20 Long-tailed Ducks plus 21 Whooper Swans -which included a flock of 18 (15 adults, 3 juveniles) new birds south through the island. The Northern Harrier remained into its third calender month and there was also 2 juvenile Hen Harriers, a female Sparrowhawk, a Kestrel and 2 Short-eared Owls seen. 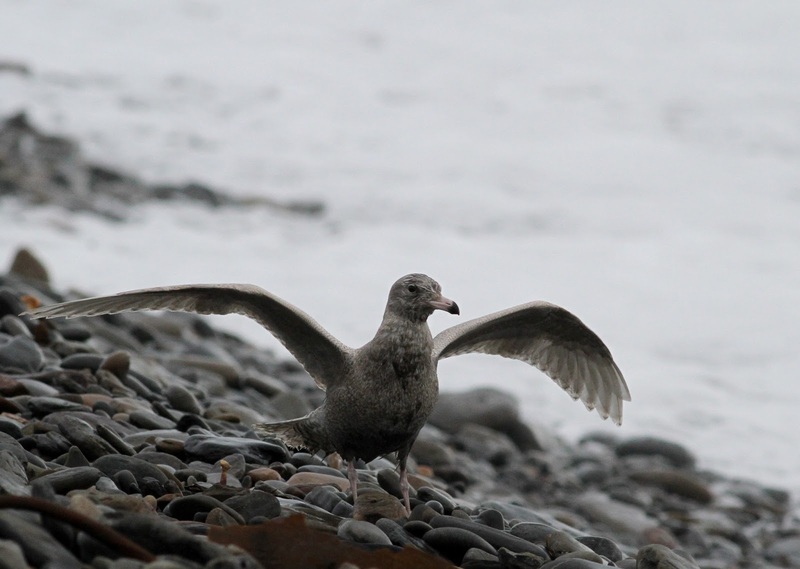 There were now 2 juvenile Glaucous Gulls (Nouster bay and Garso wick) present, plus 4 Woodcocks though a very late Ruff at Cauldhame scrape was less expected and rather late. A handful of new passerines helped take the days totals to 13 Robins, 3 Black Redstarts (2 new birds at the Lighthouse), 3 late Wheatears, 81 Blackbirds, 55 Fieldfares, 7 Song Thrushes, 110 Redwings, a Mistle Thrush (first of autumn), 4 Blackcaps, 11 Chiffchaffs, 8 Goldcrests, the 2 Great Grey Shrikes still at Holland gardens (trapped and ringed today) and Ancum Willows respectively, 6 Bramblings, 5 Siskins, the Yellowhammer and a Snow Bunting. The wind returned today but it did stay dry allowing plenty of coverege and a fair bit to be tracked down in the cool southerly breeze. Lingering highlights were the male Northern Harrier and the 2 Great Grey Shrikes while on a local level, the arrival of a Yellowhammer at Senness was a much sought after first of 2015. Passerine figures came to 21 Meadow Pipits, 35 Rock Pipits, 18 Robins, 2 Black Redstarts, 3 Wheatears, 103 Blackbirds, 120 Fieldfares, 18 Song Thrushes, 294 Redwings, 5 Blackcaps, 5 Chiffchaffs, 8 Goldcrests, 4 Chaffinches, 18 Bramblings, a Siskin and 10 Snow Buntings. After the influx earlier in the week just 5 Short-eared Owls were located today and there were also 2 Kestrels and 12 Woodcocks. Flocks of 30 Pink-footed and 9 Barnacle Geese among the Greylags included some newcomers, there were also 9 Grey Herons and among the 200-300 each of feeding or storm driven Common, Herring and Great black-backed Gulls were a juvenile Glaucous Gull and 3 Black-headed Gulls. 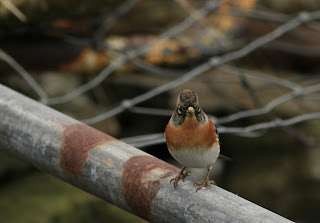 With most of the day having been spent exploring neighbouring Papa Westray, the few hours of remaining daylight were spent with the nets open at Holland House with only a brief look at other areas. There was no chance to record any numbers properly but perhaps just 100 each of Blackbirds, Redwings and Fieldfares suggested many birds had moved on under the clear skies of the night before. The male Northern Harrier was however still present as were the 2 Great Grey Shrikes (at the Kirk and Ancum Willows) and there was also a Long-eared Owl at Holland gardens and at least 2 Short-eared Owl present. About 50 birds were caught and ringed at the nets, mainly Blackbirds while other birds seen (mostly) in that area included 8 Woodcocks, a Black Redstart (at Burray), 4 Chiffchaffs, a Siberian Chiffchaff, 2 Chaffinch, 10 Brambling, 3 Siskins and a Snow Bunting. Another day with plenty of birds with an even stronger south-east wind having picked up overnight which for the team was far from ideal given their planned trip to Papa Westray in the afternoon - risky business!!! 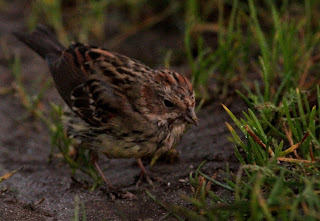 There was still a strong effort in the morning though and from dawn it was clear that there had been a big arrival - especially of Blackbirds, with birds shooting out from behind every wall or rock on the west coast, and a total of 927 was recorded from the four hours we managed in the field. Other thrushes were still conspicuous too with 1525 Fieldfares (many newly arrived birds heading straight out south in large flocks), 56 Song Thrushes, 787 Redwings and 2 Ring Ouzels also counted. Just like yesterday, there were a lot of other migrants about with at least 2 Great Grey Shrikes present with an individual still at Holland and a new bird at Brigg (plus several sightings of perhaps a third individual nearby). 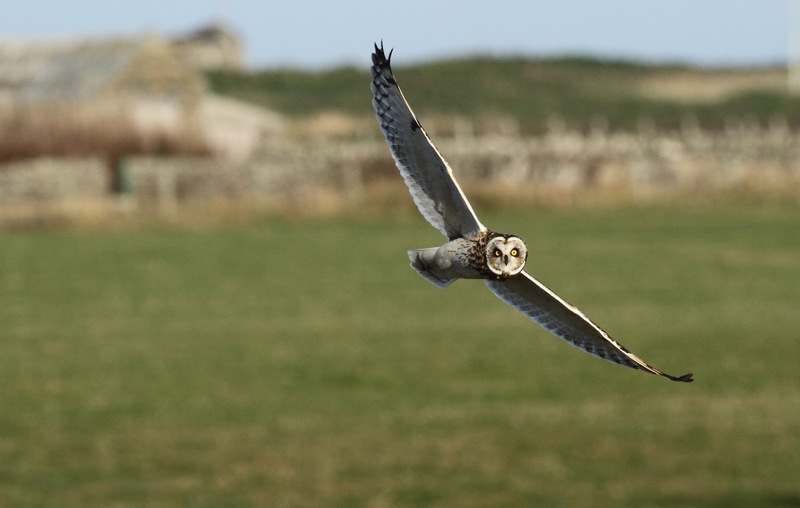 Even more Owls were seen, with a minimum of 24 Short-eared Owls - again the majority on the shelterd west coasts and 4 Long-eared Owls while there were also 35 Woodcocks, 2 Jack Snipes and 5 Woodpigeons. 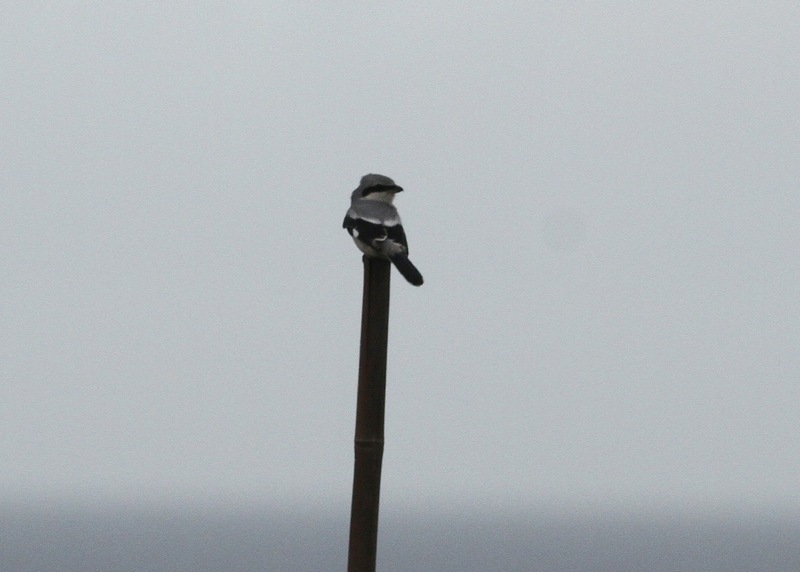 Small passerines were tricky to find in the conditions again but noted were 2 Wheatears, 41 Robins, 6 Blackcaps, 8 Chiffchaffs, 13 Goldcrests, both the Pied and Spotted Flycatcher, 2 Chaffinch, 13 Bramblings and 8 Snow Buntings. Finally, the male Northern Harrier was agian ever present, plus at least one Hen Harrier and there were 19 Long-tailed Ducks and 2 Goldeneyes on the sea.